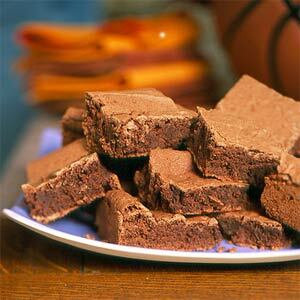 Bourbon and vanilla enhance the rich chocolate flavor of these moist brownies. If you don’t want to use bourbon, use hot milk in its place. Combine sugar and butter in a large bowl; beat with a mixer at medium speed until well combined. Add vanilla and eggs; beat well. Add flour mixture and bourbon mixture to sugar mixture, beating at low speed just until combined. Spread batter into a 9-inch square baking pan coated with cooking spray. Bake at 350° for 25 minutes or until a wooden pick inserted in the center comes out clean. Cool in pan on wire rack.